The 29th match of IPL 2019 will feature Kolkata Knight Riders hosting Chennai Super Kings at the Eden Gardens on April 14. 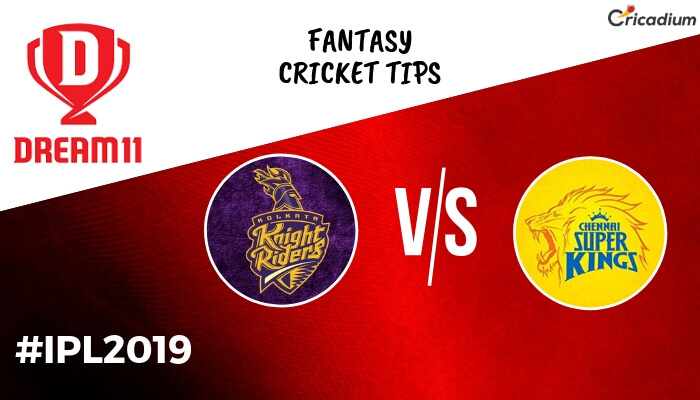 Keep reading to find out Dream 11 team prediction and Dream 11 fantasy cricket tips for the today IPL match 2019 KKR vs CSK. CSK has been tremendous in the tournament so far. The MS Dhoni-led side has lost just one game and is sitting pretty on top of the IPL points table with 6 wins. The had decimated KKR in their previous meeting earlier this season. In the second encounter, the defending champions seem to have an edge over the opposition. Check out the Today IPL match 2019 KKR vs CSK Dream 11 Prediction and Team. Between MS Dhoni and Dinesh Karthik, it’s advisable to pick the former in the team. He has been in good touch this season. In the last game against Rajasthan Royals, he had earned the Man of the Match award for his match-winning half-century. The Eden is known to be a batting-friendly surface. Also, the batsmen who are good against pace would be in the advantage. So, the likes of Shane Watson and Faf du Plessis could be decent picks. Watson can go ballistic at the top of the order on such a surface which makes him a good candidate for being the vice-captain. Andre Russell has to be in the side. For his outstanding form in all the matches so far, we back him to be the captain. The spinners could come in handy as the game starts at 4 PM. So, Imran Tahir and Kuldeep Yadav could be the X-factors. Also, once the toss takes place, we might modify the teams as per the playing XIs. Please check this blog after the toss for the updated squad.